Anime should be the poster child on how the internet changes the world. Here you have a very particular type of entertainment that solely originates from one tiny corner of the planet. It is produced by Japanese, filled with influences from the Japanese culture, and is created specifically for the Japanese audience. However, now that the whole world is easily connected to each other via the internet, this medium is being introduced to a brand new audience in complete foreign markets. Anime has now become fully global, and it grows in popularity every day. Now whenever the Japanese make a new show, the whole world is watching. But have the Japanese even realized that yet? In a way, anime has already become the poster child of the power of the internet. Unfortunately, it has done so by the elaborate system of pirating and illegal distribution. When a new anime is aired on Japanese TV, fans take a digital recording of the broadcast and add subtitles to the show in their own native language. These “fansubs” are then illegally redistributed over the internet for others to find and watch very easily. Bittorrent tracking sites and other meccas of illegal downloads contain sections dedicated specifically to anime and distinguish it separately from domestic TV and film. 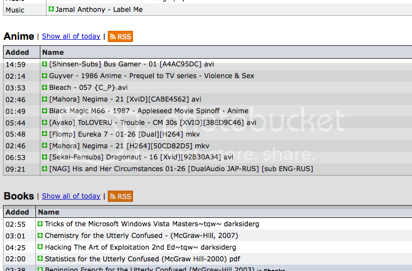 Bittorrent sites dedicate entire sections to anime. This fansubbing system is illegal and often very shady, but it is quick and efficient. A new show reaches a foreign audience with in days rather than the years it would take to license a show for foreign DVD distribution. Wouldn’t you think that the Japanese companies would want to take advantage of this new form of distribution? After all, it has been a system in operation for many years now without any sign of slowing down or falling apart. American anime distributors have most certainly seen this writing on the walls for quite some time. As internet bandwidth gets faster and less expensive in the US, then the more and more American otaku get on board the fansub bandwagon. By the time a new show makes it to American DVD, it has already become yesterday news to many. That is why it is no surprise that the anime DVD market has seen a decline in sales in recent years. The internet is changing the market. That not to say that the American companies are doing nothing about it. They are most certainly trying to change and adapt by offering their content on paid download services. I wrote a very lengthy summary of this earlier this year. But like I said in that essay, these services have several fatal flaws. Most of them are copy-protected with Digital Rights Management (DRM) software and will not play on Macs or any other non-Windows machines. Funsubs, on the other hand, have no DRM and play just fine on all my computers. Also, many are priced considerably high and do not offer any free, ad-supported solutions, which could turn away many fans who are not sure if they are going to even like the show in the first place. But another interesting point that I mentioned in that blog post was how FUNimation wanted to put their entire catalog online for download, but were prevented from doing so due to objections from the Japanese licensors. Later on, FUNimation CEO Gen Fukunaga did an interview where he once again expressed a desire to expand into the online market with anime by fallowing the fansub model of free video with no DRM. However, the Japanese licensors would not allow it. The Japanese are holding back the full potential of anime over the internet! The Japanese are turning out to be very concerned and paranoid over the internet and illegal downloads. They have recently made the news for threatening to cut off internet access to anyone caught doing it. With the Japanese licensors refusing to budge like this, it made me very angry to think that they were holding back American distributors from making progress. And when Bandai Visual USA tried pushing their own DRM’ed video service from Japan to America two weeks ago, I was infuriated. Again, this copy-protection video does not work on any of my Mac computers. Was this their idea of “progress” in the American market? And then three days later, the Japanese company GDH, which many are familiar with as the anime studio Gonzo, made an announcement that is going to change everything about anime and the internet. Gonzo’s two newest series, The Tower of DRUAGA and BLASSREITER will be simultaneously released online with English subtitles the same day as it is broadcasted on Japanese TV. Starting later this week, viewers all over the world will be able to see the two show streaming for free on the popular site YouTube.com, or they can purchase a DRM-free video download from the newcomer service BOST TV. Wait a minute… huh? Is that correct? Is Gonzo utilizing the same system that fansubbers have been using for years? You bet they are, and they are probably going to do it much better than current fansubbers do. Think about it, fansubbers. Think about that brand new episode that you’re just itching to get the raw of so that you can be the first to post your subtitled version on Bittorrent. If you’re not the first, than you’re not going to get the most views and hits. Well, it turns out that Gonzo’s already got that raw video. In fact, they had it back when it really was a “raw” video. And they also took their sweet time subtitling it as well because no matter what happens, they are always going be the first to hit the net with it. But why is Gonzo doing this? Well, the first you have to consider the way the anime market works in Japan. Anime companies are not making a profit by just their TV broadcasts in Japan. In fact, some even have to pay the stations to broadcast their shows. They use the broadcasts as a marketing tool for future DVD sales. Japanese companies can charge $50 per volume of anime DVD because the series has gained enough of a dedicated fan base through the TV broadcast who are willing to buy the DVD. This TV-to-DVD strategy is not that different in America. In fact, just looking right now on Amazon.com, I can tell you that the top selling non-theatrical anime DVDs are currently Dragonball Z, Cowboy Bebop, Naruto, all of which have been aired on American television. 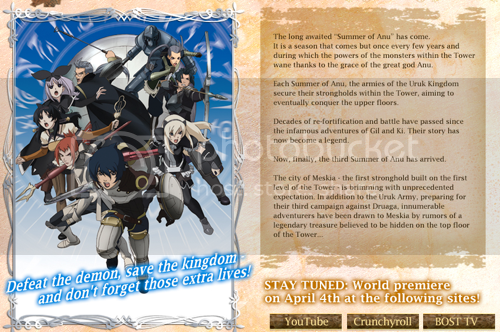 But most anime is not aired on American TV and do not have that type of exposer. And so anime DVDs are significantly less expensive in America, but the market still struggles to turn a profit without a TV broadcast. I would have to say that Gonzo’s move is their way of bringing that “mainstream television exposer” of their titles to the overseas market. They are promoting titles that they believe will eventually make their way onto American DVD. And judging by the studio’s track record, odds are that these shows will be picked up sooner or later. The question is will this new move translate to better DVD sales? First of all, the factor of the timing of DVD release is still critical. You can expose these shows to the fans now, but if it takes years for the DVDs to come out, the hype goes away and many will lose interest in the titles. These two new shows will have at least the first volume DVD released in Japan before the series is finished airing on TV, but it will take at least a year for that DVD to come out in America. That is, if it even comes out at all. Which is why I’d like to take a look at the BOST TV aspect of this deal. Again BOST TV will offer these shows as a DRM-free video download for $2 per episode or $20 per 12-episode season. That’s DRM-free… as in no copy protection. No restrictions on how you can play the video, no expiration date, and best of all, no need for Windows! This is very revolutionary. 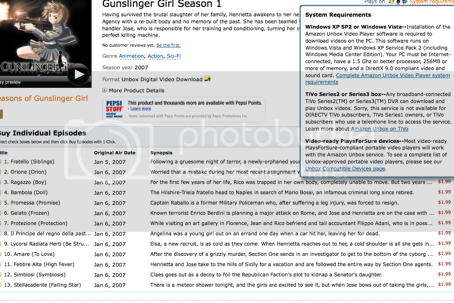 None of the other major online video services offer DRM-free video. Not Amazon, not Xbox marketplace, not Netflix, not even my beloved iTunes! In my opinion, this is not only the best thing to have ever happen to the online anime industry, it’s also the best thing to happen to online video in general. I look forward to finally being able to legally purchase anime online that is brand new and fully compatible with my Mac computer. In fact, it appears BOST TV will go that extra step in pre-formating the videos to play on iPods, iPhones, and PSP systems. And of course, if you need to convert the video to any other format, you can do so without breaking the DMCA or any other US copyright laws. And this brings me back to the question of how Gonzo can profit from this. While neither company will go into details of the deal, I can confirm that Gonzo is actually receiving a cut of the BOST TV sales. That means that when you purchase these downloads, you can be confident that your money is going to fund the people who made these shows possible. And after all the effort they put into subtitling and making the shows easily available, don’t you feel like you kind of owe them a little in return? But even looking beyond that, I see this as being a completely new and innovative business model for the entire anime industry. The Japanese company is finding a way to monetize the overseas market without having to go through an overseas distributor. They are finally able to profit from the internet audience while the show is brand new and at the peak of its hype, just like a Japanese DVD release does for the Japanese market. And if the show receives a large enough fanbase online, they can pass it off to a foreign distributors to produce DVD collections for those diehard non-Japanese fans who really want it. That seems to me like a win-win situation. If every company jumps on this bandwagon, then not only will people stop fansubbing, they wouldn’t even have the need to do it. We can all enjoy the freedom of watching anime, paying for what we like, and never having to feel that shame of breaking the law or screwing over the creators. 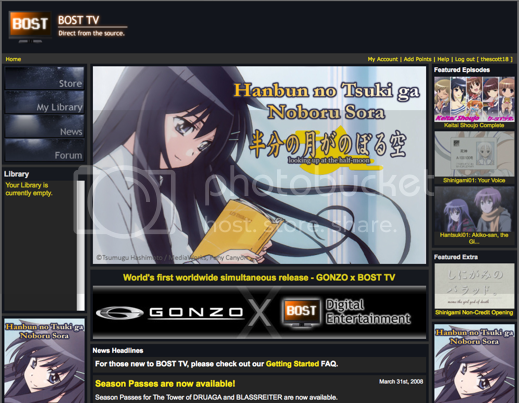 So while other Japanese companies continue to ignore the potential of the internet bringing anime to a global market, Gonzo stands out and boldly utilizes the pre-established fansub system of distribution. I believe that we owe it to Gonzo to support them completely in this endeavor. If you just want to watch or sample the new shows, then check it out on their free YouTube streaming channel. If you like what you see, then throw down the two bucks and purchase the DRM-free video. Let’s show those other Japanese companies that the world wants anime, and we are willing to play nice if they take the time to include us on it from the very beginning. This entry was posted on Tuesday, April 1st, 2008 at 8:00 am by Scott	.